Piramal Enterprises’ Consumer Products Division today announced the launch of two new product variants of its heritage brand, Lacto Calamine – Lacto Calamine Oil Balance Face Wash and Face Scrub. The new variants launch marks over 45 years since the original Lacto Calamine was launched. 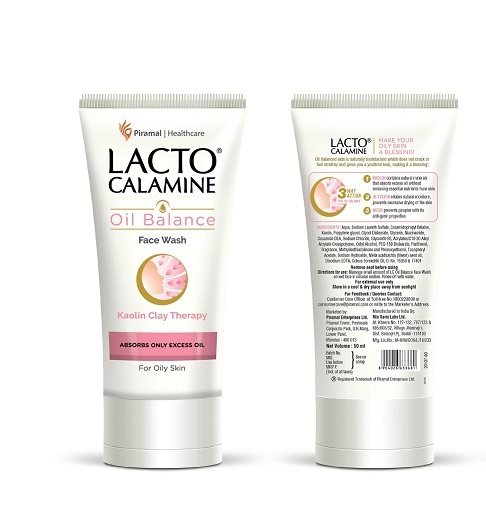 A trusted skincare product in households across the country, Lacto Calamine has combined consumer research along with philosophy of uniting science to create a unique formula that provides up to eight hours of oil free skin. The new variants are clay-based Kaolin with three-way action, which only removes excess oil, retaining essential oils, and protecting the skin from bacterial infections, making it an essential product for people prone to oily skin, and offering a complete regimen. “As a trusted companion to customers across India, the two new variants are a testament to our commitment to constantly develop and enhance our products, spearheading innovation in the market, while raising the bar for quality in the over-the-counter industry of India. Currently, Lacto Calamine reaches over 3.5 lakh households. As part of our strategy, we will be looking at various products in the clay-based to help consumers solve other oily skin problems,” he added. Lacto Calamine, India’s leading calamine lotion, known for its effectiveness in managing oily skin problems, is the result of years of research and development within the problem areas faced by today’s evolving consumer base. Piramal Consumer Products Division is assisting this change in shifting perceptions by launching the new variants that address all skin related problems to give you a smooth, blemish – free and beautiful skin. Along with the invigorating new variants, Lacto Calamine now boasts a modern and refreshed look that will appeal to consumers today. Lacto Calamine consists of natural ingredients such as Kaolin Clay, Glycerine, Zinc Oxide, Lemon Extracts, Aloe Vera, Cinnamon Extracts and Neem. Piramal Enterprises Limited (PEL) is one of India’s large diversified companies, with a presence in Pharmaceuticals, Healthcare Insights & Analytics and Financial Services. PEL’s consolidated revenues were over US$1.3 billion in FY2017, with 51% of revenues generated from outside India. In Pharma, through an end-to-end manufacturing capabilities across 13 global facilities and a large global distribution network to over 100 countries, PEL sells a portfolio of niche differentiated pharma products and provides an entire pool of pharma services (including in the areas of injectable, HPAPI etc.). The Company is also strengthening its presence in the Consumer Product segment in India. PEL’s Healthcare Insights & Analytics business, Decision Resources Group, is the premier provider of healthcare analytics, data & insight products and services to the world’s leading pharma, biotech and medical technology companies and enables them to take informed business decisions. In Financial Services, PEL, through its Piramal Fund Management Division, provides comprehensive financing solutions to real estate companies. The Division’s Corporate Finance Group (CFG) also provides senior and mezzanine growth capital to various businesses across varied sectors that are integral part of India’s growth story. The Division has also launched Distressed Asset Investing platform that will invest in equity and/or debt in assets across sectors (other than real estate) to drive restructuring with active participation in turnaround. The total funds under management under all these businesses are ~US$5 billion. The Company has recently applied for HFC license. The Company also has strategic alliances with top global funds such as APG Asset Management, Bain Capital Credit, CPPIB Credit Investment Inc. and Ivanhoé Cambridge. PEL also has long term equity investments worth ~US$700 million in Shriram Group, a leading financial conglomerate in India. PEL is listed on the BSE Limited and the National Stock Exchange of India Limited in India. The Consumer Product Business is one of the fastest growing players in the Domestic Consumer Healthcare Market and is currently ranked 7th amongst all OTC players in India. The Business has a portfolio of brands like Saridon, Lacto Calamine, I range of Products (i-pill, i-know, i-can), Quik Kool, Polycrol, Jungle Magic, Tetmosol, Caladryl, Littles, Naturolax, Lacto Bacil plus etc. and has six brands amongst the top 100 Indian OTC brands. Most of the brands in the portfolio are either No 1 or No 2 in their respective categories. The business has a strong distribution footprint and covers all the 20k+ population towns across the country.